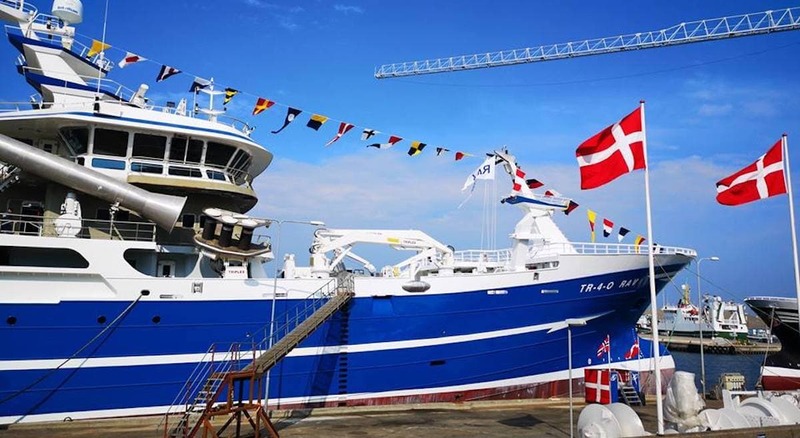 Norwegian fishing company Peter Hepsø Rederi’s new pelagic vessel Rav was christened at a ceremony in Skagen at the weekend, making it the latest fishing vessel to join the Norwegian fleet. The new Rav is a 79.75 metre by 15.50 metre pelagic vessel designed to trawl for blue whiting and to operate as a purse seiner when fishing for mackerel and herring. Like the majority of the new generation of pelagic vessels from Karstensen, Rav is the yard’s own design, completed in close co-operation with the owners. Rav incorporates plenty of innovation, including being fitted with a Wärtsilä 31 main engine as part of its all-Wärtsilä propulsion package with a two-step gearbox, offering a variety of propulsion modes. Johnson Controls have supplied the twin 1525kW RSW system. The design also incorporates an enclosed foredeck that increases safety levels for the crew and increases the vessel’s freeboard significantly compared to conventional pelagic vessels, plus Rav has a package of electric deck equipment that includes a MacGregor Triplex electric net winch. Both Petter Hepsø Rederi and Karstensens Skibsværft have heritage going back more than a century. Rav’s owners are a family company dating back to 1917, currently run by four siblings of the third generation of the Hepsø family, while the fourth generation is also active on board. 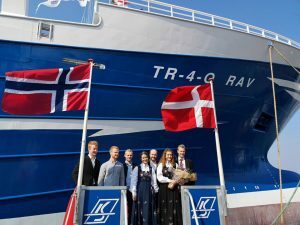 The company is run by general manager Audhild Hepsø, with her sisters Kristin and Marit Hepsø as co-owners and partners, while their brother Petter Hepsø sails as mate and Marit’s husband Henning Sundet is Rav’s chief engineer. Karstensens Skibsværft is also a family company established in 1917, today run by the third generation of the family that founded it.